Some random photos of our first ECW game. 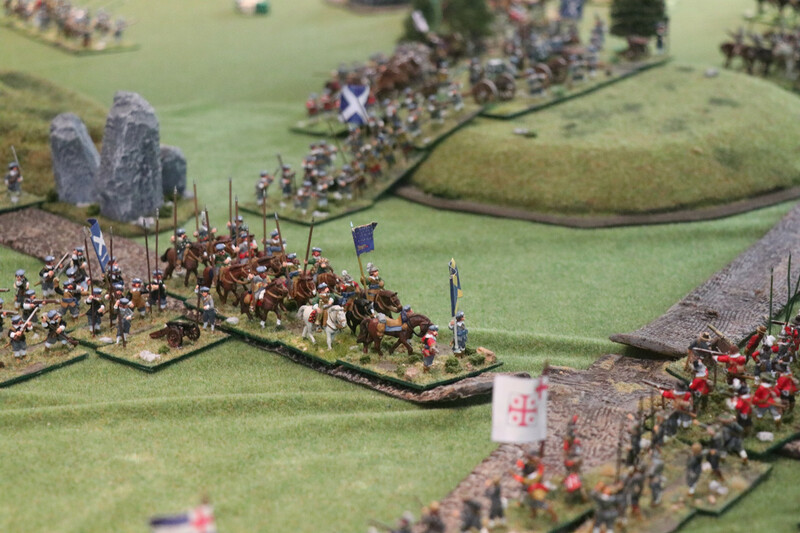 The Royalist English invaded the Lowlands & successfully confronted a Covenanter army. You can see the Covenanter camp in the background. The Royalists were strong in Horse, the Covenanters in artillery....unfortunately scissors beats paper. Some of the Covenanter Horse. Looks good, performs poorly. Apologies for the lack of a coherent photo report, but we were too busy playing! Thanks, Donald! The usual question: ruleset? Mr. Andrea wrote: Thanks, Donald! The usual question: ruleset? We've used their Ancient set for our Punic & Bronze Age gaming for several years so this, our first game, did not have a huge learning curve. However, it is quite a dense set of rules with some differences &, most importantly, all the new troop types with their different capabilities. It will take a number of games before we can truly absorb all the nuances. The table and figures looked great! And the figures look even better in the close up photos. 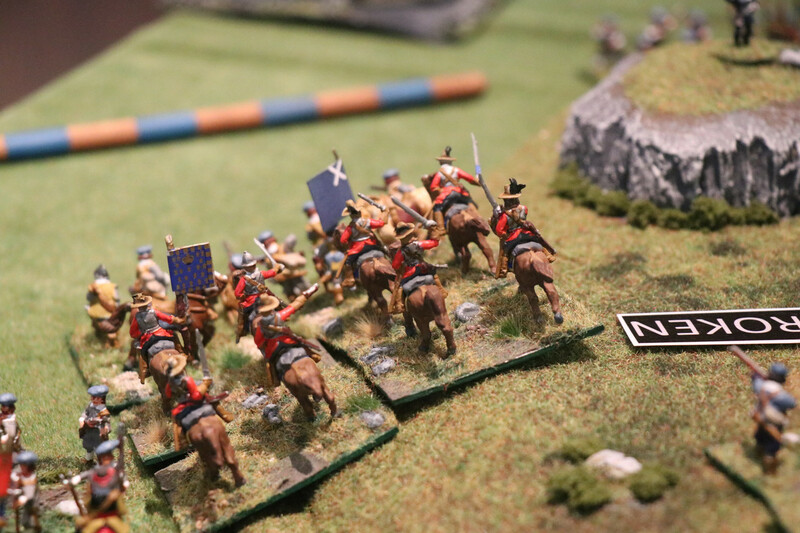 A very interesting battle with infantry that defended doggedly (Covenenter) and attacked tenaciously (Royalist); cavalry that was swift and agressive, though not always in the desired formation; and artillery that was very pretty and noisy. The effectiveness of the gunpowder weapons was patchy, which I thought was most appropriate for the period; but of course I am as new to this as Jan. Your comments on what was, I believe, your first wargame are very interesting. 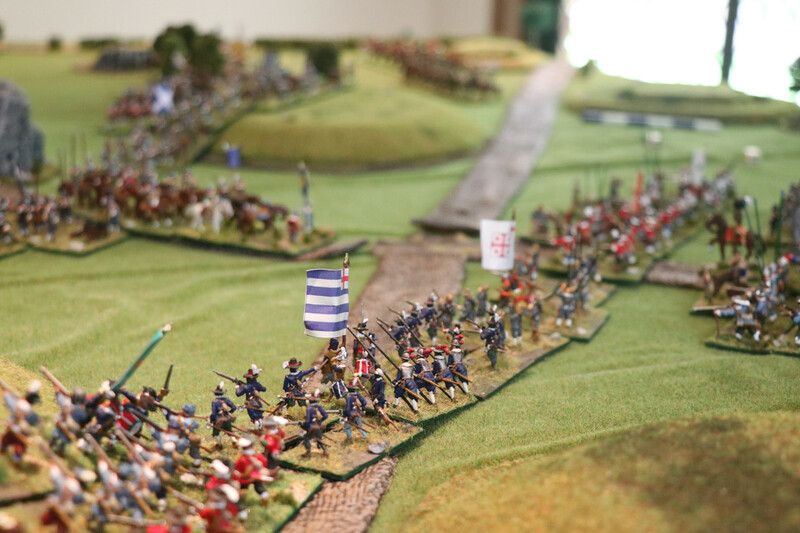 The game was, as you know, a "what-if" rather than the re-creation of an actual battle. In most wars there are so few historical battles that unless you like fighting a battle over & over again, most games are based on such historical fiction. 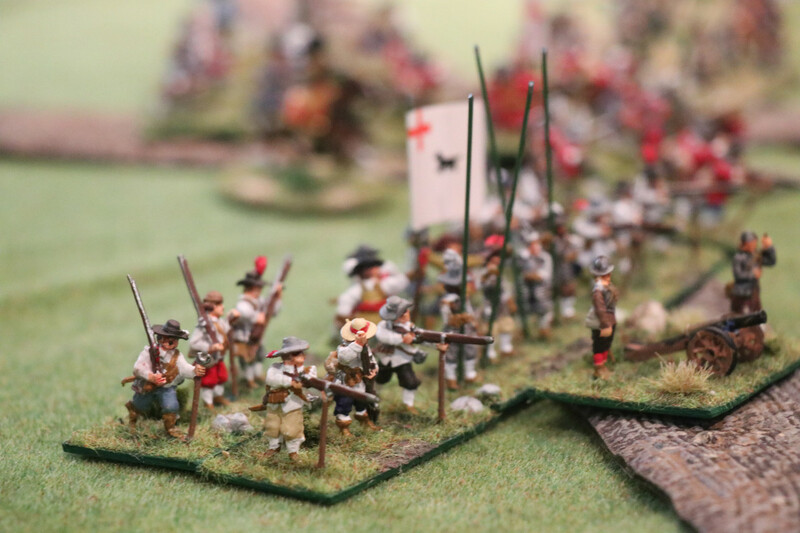 My definition of a good set of rules is that it encourages you to fight using the tactics of the period and the army lists give you soldiers who use resemble those of the time. The problem becomes the "game" side of the activity. 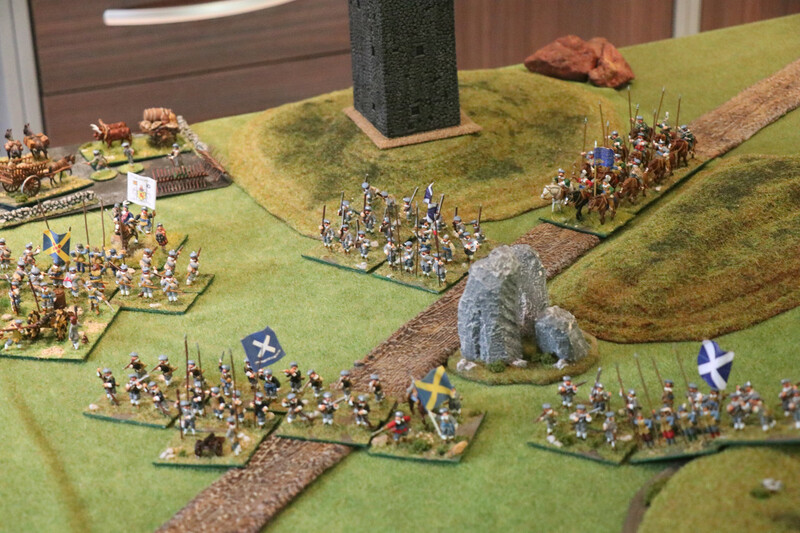 If the game only produces outcomes that are historical, then the Covenanters need to lose comprehensively every battle. This would become tiresome. So that's where the "what-if" steps in. 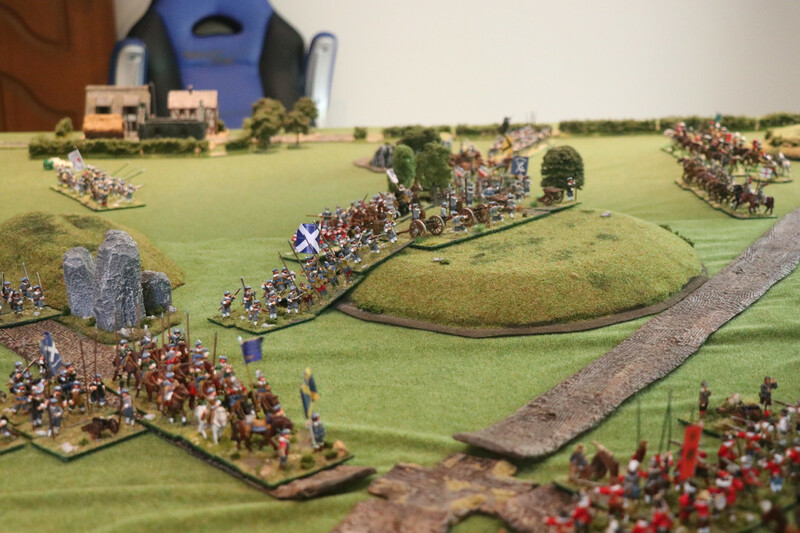 How about a battle in terrain that favours the Covenanters? How about giving them an extra 20% of troops? Can we allow an ambush, an outflanking march, random unfortunate occurrences (through Event Cards)? 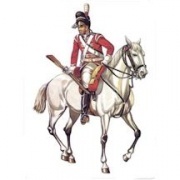 Of course, if you go too far, then the English have no hope of winning & tiresome sets in again. The "what-if" also has to apply to re-creation of historical battles. 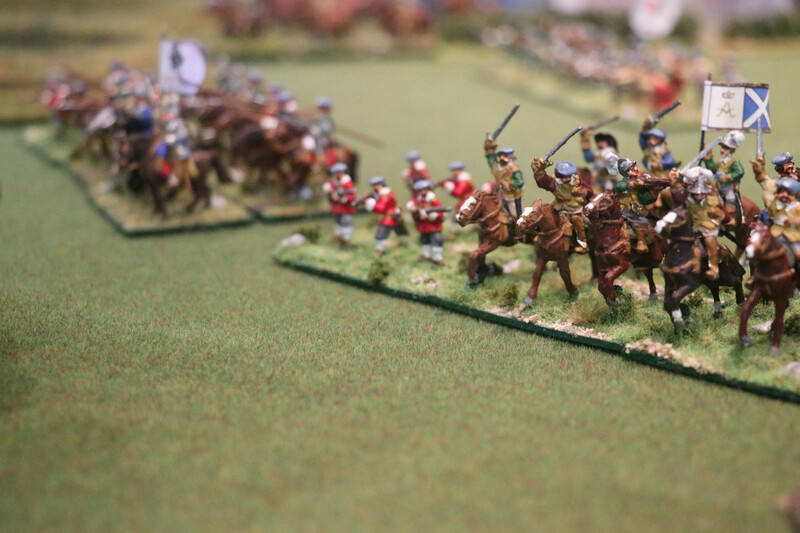 Waterloo is only worth the effort if the French have a reasonable chance of winning. I'm glad you liked the game. We will see you again, I hope, over the wargames' table. The Pele tower & a ruined church you can see in the photos are from the excellent Any scale models.They’re resin & paint up extremely well. The owner of Any scale, Stuart, has indicated he’s working on ” scratchbuilding some new 1:72 scale Scottish stone cottages, a ruined broch and a new larger tower house” in 1/72 scale. Certainly on my shopping list. That's a stroke of luck, weren't you looking for black houses? I wouldn't mind a couple of crofts myself, and a ruined broch sounds good too. Graeme wrote: That's a stroke of luck, weren't you looking for black houses? I'll keep you posted, Graeme.